Flowing southwest from the Continental Divide into the Clark Fork River, the Big Blackfoot River is what Montana fly fishing is all about. 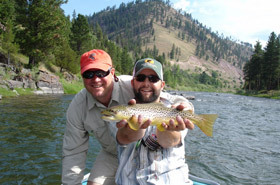 Fly fishing the Big Blackfoot River will provide you with a wealth of diverse trout water. The Blackfoot offers about 80 miles of continuously changing prime trout fishing habitat- fast pocket water dropping into deep clear pools, with lots of riffles in between and on the bends. The Blackfoot River cuts canyons through forested cliffs and meanders though meadows and fields. This is a river of legend. Meriwether Lewis and a small group diverted from the main party of the Corp of Discovery to explore it on their historic return from the Pacific. Norman Maclean wrote of the river in his epic “A River Runs Through It.” See it, fish it and you will experience the appeal the Big Blackfoot River has. An interesting history of exploration, logging, mining, and trout fishing have resulted in some epic struggles on the Blackfoot River and what now survives is an even better trout river. The good health of the Big Blackfoot River and its spawning tributaries is evident and the great fly fishing is a direct result. The river offers good numbers of healthy brown trout, rainbow trout, native westslope cutthroat trout, and occasional brook trout. Although the healthy nursery produces a lot of juvenile fish, there are plenty of large trout and you can expect trout of these species in the 10”-18” range with the occasional 20 incher. The Blackfoot River, with its deep pools and pocket water, is also perfect habitat for the native bull trout. This is very much a “canary in the coal mine” species, indicating the good health of the rivers it habituates. Although protected and not targeted it is impossible to keep this voracious carnivore from occasionally attacking a streamer, San Juan worm, or small trout or white fish that has taken a fly. The bull trout in this river often exceed 30 inches, so, if this happens, it will not be forgotten. Dry fly fishing the Big Blackfoot River can produce very good action with large attractor patterns. Nymphing is always productive so a dry/dropper rig is the common set up. And with those deep pools, steep cliff walls, and big boulders in pocket water that the Blackfoot River offers, streamer fishing produces big trout.